1. Cut avocados in half. Remove seed. Scoop out avacado from the peel, put in a mixing bowl. 2. Using a fork, mash the avocado. Add the chopped onion, cilantro, lime or lemon, salt and pepper and mash some more. Chili peppers vary individually in their hotness. So, start with a half of one chili pepper and add to the guacamole to your desired degree of hotness. Be careful handling the peppers; wash your hands thoroughly after handling and do not touch your eyes or the area near your eyes with your hands for several hours. 3. 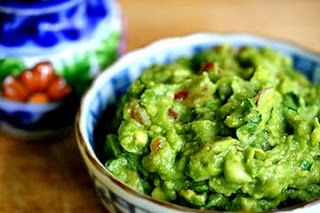 Cover with plastic wrap directly on the surface of the guacamole to prevent oxidation from the air reaching it. Refrigerate until ready. 4. Just before serving, add the chopped tomato to the guacamole and mix.